Now Spring is here, it’s the perfect time to spring clean your diet, upgrade your life, start those preparations for the perfect summer body and discover your Raw Liberty! 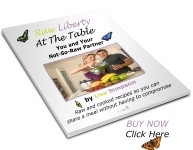 The journey to securing Raw Liberty for You: transforming your home and your heart, as you discover your true inner being through raw foods and lifestyle is a truly magical journey of self discovery! Whether you are new to raw foods; trying to work out how you can incorporate them successfully into your life, whilst still cooking for family and friends, or whether you have made some steps to transform your life and are ready to up your game, create your vision and live the life of your dreams, I have a coaching package which suits you! Are you ready to transform your life, to enable you to stay true to yourself and live harmoniously raw in a cooked food home, and find your true inner being through raw food and lifestyle? If the answer is ‘YES!’ one to one coaching could be just what you need! and let the magic begin! The first three people to sign up for a coaching package this Spring will receive £100 discount! <?xml:namespace prefix = v ns = "urn:schemas-microsoft-com:vml" /><?xml:namespace prefix = w ns = "urn:schemas-microsoft-com:office:word" /> If for some reason you don’t feel ready for a coaching programme, and would like an individual session with me to ask any general questions you may have, to gain raw recipe inspiration, to work on a specific issue, or whatever else you may wish to use your time for, I would be more than happy to be of service! If you’d like to book an hour’s session with me, the price for this session is now just £49. On receipt of payment you will receive the link to my online diary to book your personal coaching call at a time that is convenient for you.